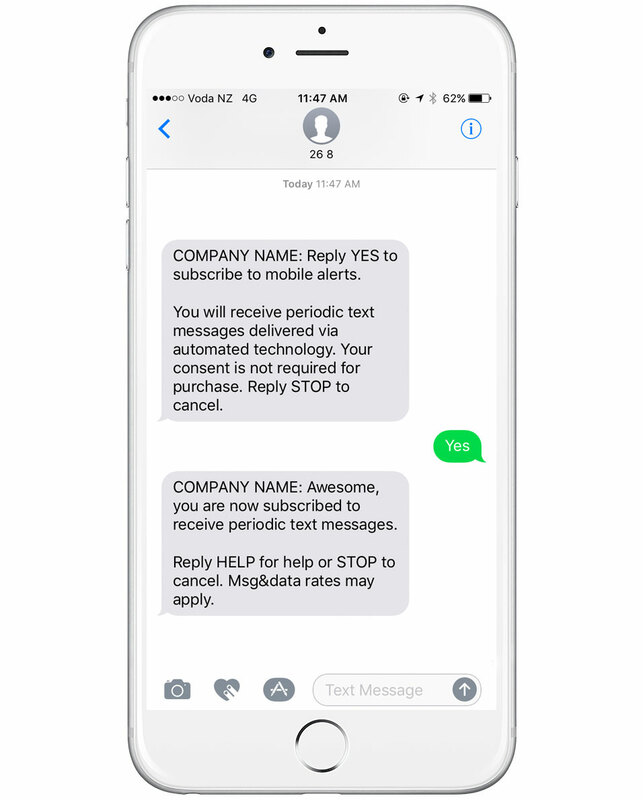 In the US, recipients of your text messages must have expressly consented or "opted-in" to receive text messages from your business. There are multiple ways that your recipient can opt-in, however, your campaign's message flow must meet industry standards defined by The Wireless Group (CTIA) and comply with the Telephone Consumer Protection Act (TCPA), which is US law. In this article, we will show you the different, compliant methods of opt-in you can use. 1 - Create a campaign. Select the new campaign type, not legacy. 3 - Add a send a text action off your keyword received goal. Select double opt-in as your opt-in process. Compose your opt-in and confirmation text messages. Remember these messages must meet the requirements set forth in the CTIA and TCPA. View the requirements for your opt-in text here and your confirmation text here. A non-handset opt-in is where recipients opt-in by submitting a web form. A double opt-in process should be followed. The message flow will look as follows after the recipient submits the web-form. There are multiple different ways to set up your non-handset opt-in campaign in MOBIT. The set-up method you use is determined by the web form you use. Remember that your text messages must meet the requirements set forth in the CTIA and TCPA. View the requirements for your opt-in text here and your confirmation text here. Use this method if you are using one of MOBIT's opt-in forms. Every landing page set in your MOBIT campaign has an opt-in page that contains an opt-in form. 1 - Create a campaign in MOBIT. Select the new campaign type, not legacy. 3 - Add a send a text action off your keyword received goal. Select a double opt-in as your opt-in process. Compose your opt-in and confirmation text messages. Use this method if you are using an Infusionsoft web form. 2 - Add an HTTP Post from Infusionsoft goal in your MOBIT campaign. 3 - Add a send a text action off your HTTP Post from Infusionsoft goal. Make sure that you select the box that reads "Send an opt-in text to contacts that are not currently subscribers", or else only contacts that are subscribers will receive your text message. Compose your opt-in and confirmation text messages. 4 - Set-up an HTTP post in your Infusionsoft campaign. Zapier is a web automation app. With Zapier you can build Zaps which can automate parts of your business or life. A Zap is a blueprint for a task you want to do over and over. In words, a Zap looks like this: "When I get a new thing in A, do this other thing in B." The first part is the Trigger and the second part is the Action. If the form you are using is built by a company that is available in Zapier, you can connect this form to your MOBIT campaign. There are over a dozen companies such as Formstack, Wufoo and Google forms available in Zapier. 2 - Create a triggered by Zapier goal. 3 - Add a send a text action off your triggered by Zapier goal. Make sure that you select the box that reads "Send an opt-in text to contacts that are not currently subscribers", or else only contacts that are subscribers will receive your text message. Compose your opt-in and confirmation text messages. 4 - Create a Zap inside Zapier and set up your trigger. 5 - Use MOBIT's Create/Update Contact action in your Zap.